Previous winners of the prize are: Douglas Smith for Former People: the Final Days of the Russian Aristocracy (Macmillan); Catherine Merridale for Red Fortress: The Secret Heart of Russia’s History (Allen Lane); Serhii Plokhii for The Last Empire: The Final Days of the Soviet Union (Oneworld); Dominic Lieven for Towards the Flame (Penguin); Rosalind P. Blakesley for The Russian Canvas: Painting in Imperial Russia, 1757-1881 (Yale University Press); and Alexis Peri for The War Within: Diaries From the Siege of Leningrad (Harvard University Press). 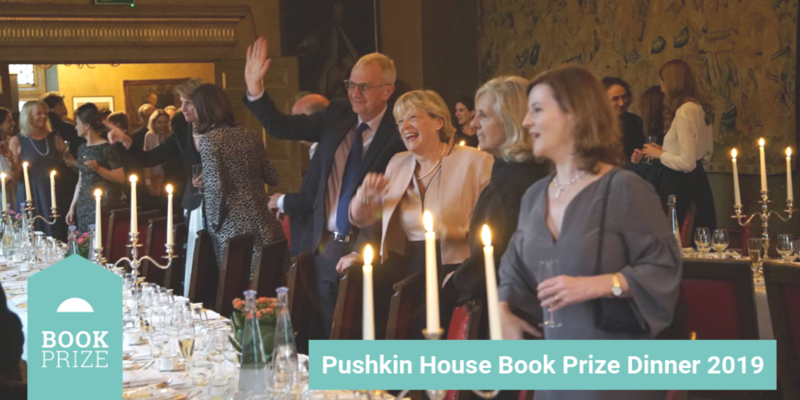 The 2019 Pushkin House Russian Book Prize is made possible thanks to generous support by by Douglas Smith (author and winner of the inaugural award in 2013) and Stephanie Ellis-Smith and the Polonsky Foundation and in 2019 we welcome the London Russian Book Club as an additional sponsor. The 2019 shortlist will be announced on 25 April 2019. The Charterhouse is a former 14th-century Carthusian monastery and burial ground for victims of the Black Death, which opened its doors to the public for the first time in 400 years las year. The complex of almshouses is surrounded by gardens and cobbled courtyards and is just round the corner from Farringdon Station and the Smithfield Meat Market. It is a hidden gem of great atmosphere just outside the City of London. The Great Chamber, The Charterhouse, venue for 2017 Dinner & Ceremony. Elizabeth I and James I both held court here.